Notes: Based on a manga by Kaishaku. As THEM Anime Reviews uses the Hepburn romanization system, the alternate title of "Kannaduki no Miko" is not used, as the syllable "du" does not exist in Hepburn (and is therefore incorrect), and furthermore, looks like Kana-Dookie, an implication that, in retrospect, sort of makes sense. Now that the DVD with an official English title is out, this is sort of irrelevant anyway. The popular, elegant Chikane becomes friends with Himeko, a shy, timid girl. From early on, they wonder if they may be feeling a little bit more than friendship for each other. But then an evil thing threatens to blow stuff up, and the only people who can combat it are the Moon and Sun priestesses, who happen to be Chikane and Himeko. They then go off on a (sexually-confused) epic fantasy quest to save the Earth! Awhile back, a friend and I decided that it would be fun to pick a short anime series that we knew nothing about and watch it in one night. Now I'm sure this is still a fun thing to do in most cases. 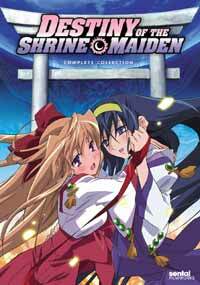 But I'm afraid it's very unfortunate that we chose Destiny of the Shrine Maiden as our first series to do this with. Because right now, I don't feel very up to trying such an experiment again, ever. Why, do you ask? Because Destiny of the Shrine Maiden proved to be a bad anime. A very bad anime. I like mecha, I like fantasy and fantasy heroines, and I like science fiction. However, I should've known that something was up with a series that advertised all of those things at once. Sure, it could work, it has worked, but it usually doesn't. It sure didn't with Destiny of the Shrine Maiden, and the results were disastrous. I did get some mecha, some Victorian fantasy (complete with maids), and some science fiction, all in one series. But the quality of these elements was down the tubes. They put in mecha so that they could sell this to mecha fans, but they didn't really care about the mecha. They put in fantasy so they could sell this to fantasy fans, but they didn't care about that either. Same goes with the sci-fi elements. The result is a series that rips off just about every type of anime fan in existence. The best I can say about this odd mish-mash of genres is that it's the closest thing to a hilarious cross-over that I've ever seen. If anyone dared to produce Macross in Hanaukyo, they would end up with something like this. Overshadowing all of Destiny of the Shrine Maiden's generic shortcomings mentioned above, however, is the most offensive marketing ploy in this basket case of a show. Remember that Destiny of the Shrine Maiden, on top of all the mecha and maids mess, also calls itself a romance anime ... a yuri romance anime. Although I was not prepared for this when I first started the series, I was ready to take the yuri theme and run with it. But they didn't care about the romance element any more than they cared about the other stuff. It's sloppy, forced romance. If it had been completely heterosexual, it would have been sloppy, forced romance, and worthy of the same contempt. Why do they put in such romance? So that they can introduce a load of yuri scenes? Why do they introduce a load of yuri scenes? So that they can they can sell homosexuality as some strange and exotic product; a freak show of sorts. When Destiny of the Shrine Maiden tries to sell mecha, sci-fi, and fantasy in this manner, it is annoying. When they begin doing it with lesbianism, it becomes EXTREMELY offensive. Because such exploitation was the main priority of this show, among all the other wily tricks up it's sleeve, it sinks to the lowest levels of "entertainment" as far as I'm concerned. The whole thing is really a way to make money off of lesbianism, while pulling in every other type of fan it can at the same time. Not only is that against my principles of why anime (or any product) should be created, but it's just not entertaining to watch, period. One last thing to mention is that, despite the clashing genres displayed on the front design, the advertisement art did manage to trick me into thinking that the visuals of this series would be very good. Well, the old trickster got me again. This series looks horrible, like a totally average series from the mid-90s. This is totally unacceptable, considering they probably did the entire thing on a computer, and could've at least made it look better than Gainax's super-low-budget stuff from the 90s. But they didn't manage to do this, and it shows. Backgrounds are bland, and characters are very pointy and plain. That's just one little morsel to add to the top of this heaping pile of junk. Recommended Audience: Nobody really. Anybody who'd actually enjoy this exploitation needs to get their head examined. However, if for some reason you're actually considering watching this thing, you have to be prepared for a whole bunch of lesbian scenes. So know what you can handle and what you can't. And these themes get pretty maturely sexual later on, from what I've heard. Pair that with some spastic violence and destruction, and nobody under 15 should really be watching this. But as I said, no one still ALIVE should be watching this.